If you are an online retailer, there are situations in which you will offer your products in various pricing states. For example, there may be some products that are on sale, some that have discounts based upon a discount code or some that are on clearance. In these cases, you may want to document the original price, the discounted price and see how the pricing state impacts conversion. In this post, I will show how to do this in Adobe Analytics and a few examples. This report can be broken down by Product as needed or you can begin with the Products report and then break that down by Pricing State as needed. And if you have classified your Products into Product Categories, you can see the same information by Product Category. Of course, those who have been reading my blog for a while may recognize that this new “Pricing State” eVar will require the use of Merchandising. 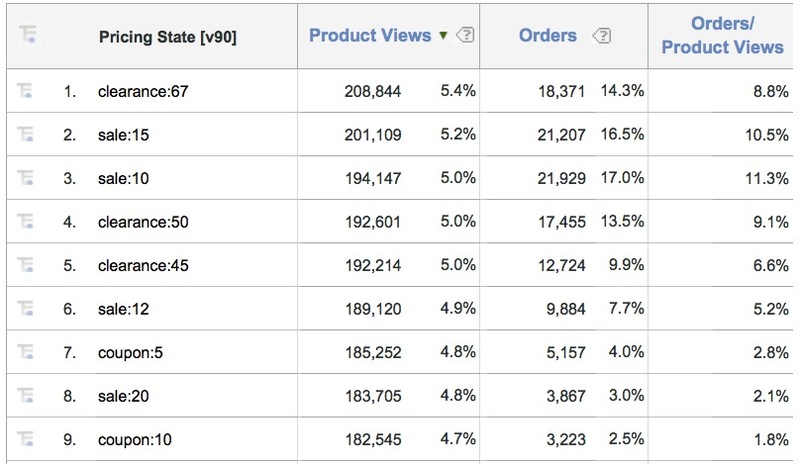 This is due to the fact that your visitors may view multiple products, and Adobe Analytics needs to record the pricing state for each product viewed versus just storing the last pricing state and applying that to all products (as would be done with a non-Merchandising eVar). In this case, since we are setting the Pricing State eVar on the product page where we are already setting the Products variable, I would suggest using Product Syntax Merchandising. This type of report will allow you to see if any combination of pricing state and discount percent performs better than others. You can use the search filter or segmentation to narrow down items as needed (i.e. just sale rows). While conducting analysis related to Pricing State, keep in mind that it is also possible to capture the dollar amounts associated with Pricing States in currency Success Events. Since all of the amounts are present the product page, it is simply a matter of passing the correct amounts to the appropriate Success Events. Let’s look at this via an example. If a visitor views the product shown above, you know that the original price was $40 and the current price is $12.99. Therefore, if a visitor orders this product, $12.99 will be passed to the Revenue metric (using the Purchase event), but nothing will be done with the $40 amount. Another cool way you can use these metrics is in the Campaigns area. By opening the Campaigns report, you can see which campaigns lead to the most/least discounted sales (see below). This might help you shift marketing dollars to campaigns that are driving sales for non-discounted products. 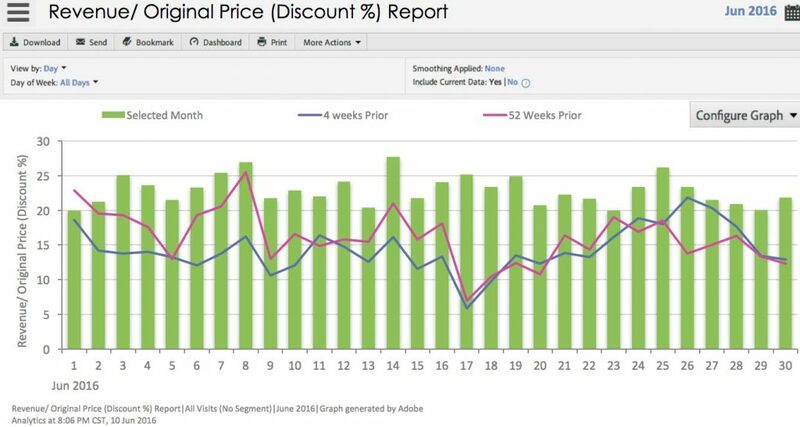 These are just some of the ways that you can augment your Adobe Analytics implementation by capturing data related to pricing state and discount amounts. Enjoy! Nice tips. Quick Q that immediately jumps to mind is how you might deal with multiple discount types applied at once (for example, a product with 20% sale discount and a further monetary reduction via application of a promo code)? Would you simply continue to extend the string passed into the eVar (e.g. “sale:20,code:5”) or would you use an alternative? 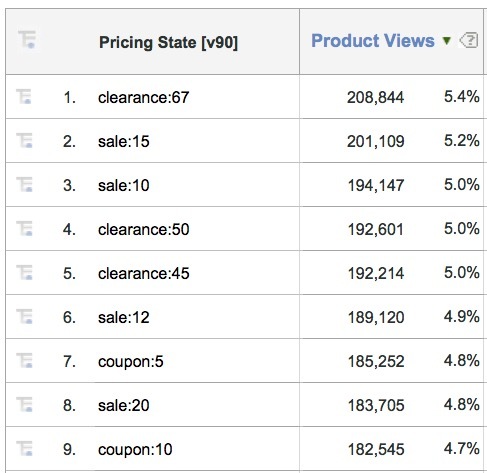 Hey Adam, since coupon codes are often times applied in checkout at the order-level, how are you applying them here in this example when your other clearance/sale/retail price are firing on a pdp view.